What Should a Home Funeral Guide be Expected to Know? Home funeral guides cultivate effective communications skills and techniques to use while assisting the dying individual, family, and others. They also advocate for the dying, the dead, and their families. Above all, home funeral guides are educators in home funeral procedures and possibilities. Home funeral guides collaborate effectively and build key relationships with personnel from care facilities, nursing homes, hospices, hospitals, spiritual communities, and government agencies, and learn how to navigate these systems. They use critical thinking and creative problem solving skills when working with the dying and their families. Home funeral guides are skilled in educating the dying and their families about their funeral options, and in guiding families through decision making challenges and after-death care tasks to ensure that the dying individual’s priorities and goals, and family choices, are realized to the greatest extent possible. Home funeral guides are knowledgeable about physical, emotional and spiritual processes that occur near, during, and after death. Their knowledge base ranges from proper body care, including what to do in special conditions and situations such as autopsy and organ donation, to completing and filing paperwork, transportation, and cremation or burial requirements. Home funeral guides assist clients and others involved in developing an initial care plan that includes use of online management tools, paper forms, calendars, and other ways of organizing funeral plans, logistics and access, time frames, and other essential planning needs. Home funeral guides possess technical legal knowledge concerning laws pertaining to client and family rights, and state requirements and protocols for home funerals. They are also versed in the legal limitations of after death business practices by non-licensed practitioners. They are knowledgeable about the needs of special populations and to cultural and spiritual needs and expectations. Home funeral guides provide support for patient and family spiritual goals by assisting in the design of ceremonies and rituals, and legacy and life review projects. 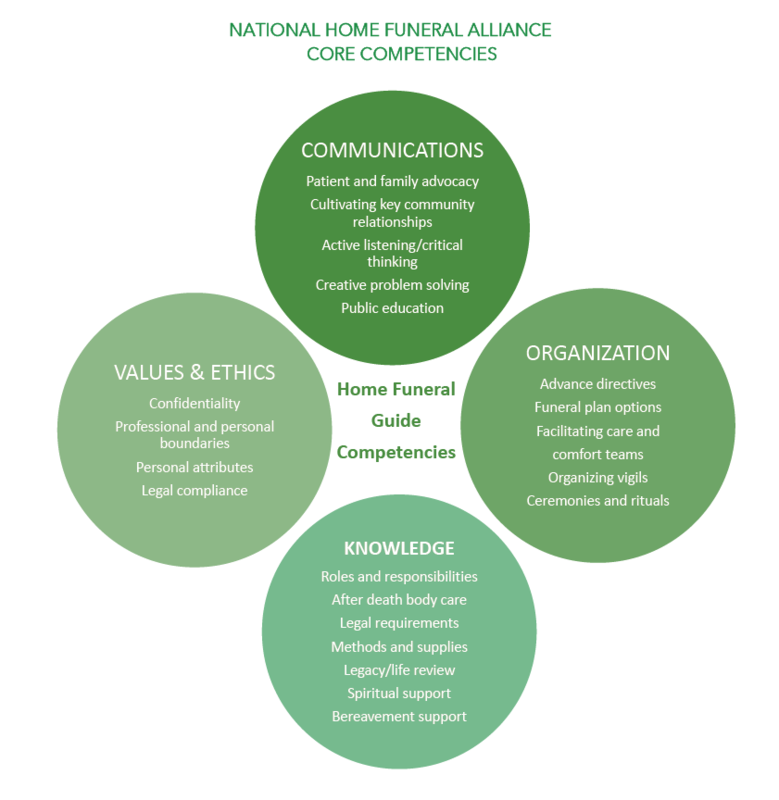 Home funeral guides know and respect their roles and responsibilities as defined in the NHFA Code of Ethics, Conduct, & Practice, and present themselves in a manner consistent with known and accepted ethical and legal conduct and values when in the field. Home funeral guides enter into relationships with families for the purpose of supporting the family in charge of a home funeral with integrity, honesty, fairness, transparency, and accountability.